We are pleased to offer for sale this 1904-S Barber Dime G-4 or Better Liberty Head Dime. The Barber Dime is circulated and will grade G-4 (Good Four) or better. This Barber Dime will have no major marks or visible problems (just honest wear) making it a great value and an ideal choice for filling the holes in any circulated set. In 1887, Mint Director James P. Kimball informed the US Congress that he was requesting a coinage redesign because he felt the US coinage was inferior to other countries. He proposed a process that would allow distinguished artist to participate in the design process. In 1890, the United States Department of Treasury invited ten artists to submit design proposals for minor silver coinage. This plan fell through when the artists made financial demands that the Treasury could not meet. The Mint next decided to open the contest to the public. Extensive internal politics surrounded the ultimate awarding of the design job. A four-member committee (which included Barber) appointed by Kimball, picked only two of more than 300 submissions for "honorable mention", finding the rest unsatisfactory. Kimball's successor, Edward O. Leech, decided to dispense with the committees and public design competitions and simply instructed Barber to develop a new design. It has been speculated that this is what Barber had wanted all along. Barber's designs appeared on the dime and quarter from 1892 through 1916, and the half dollar through 1915. This coinage is commonly referred to as Barber or Liberty Head. 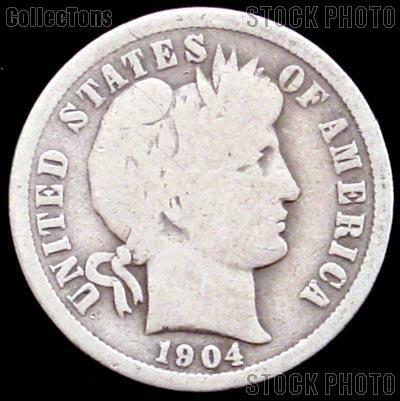 Obverse design: The basic obverse design of the Barber silver coinage consists of a Liberty head with a cap and wreath. The portrait was inspired by classical Greek and Roman figures and various 19th century French coinages. The word "LIBERTY" appears on a headband worn by Lady Liberty. Many numismatists use the condition of the engraved "LIBERTY" to determine the grade of the coin. The Liberty head on the Quarter and Half Dollar is flanked by "IN GOD WE TRUST" and 13 stars (for the original 13 colonies), on the Dime is flanked by "UNITED STATES OF AMERICA" with the date centered below. Reverse design: There were two basic reverse designs on Barber silver coinage. The dime features a wreath of Americana agricultural products with the words "ONE DIME" in the center and the mintmark (if applicable) below. On the quarter and half dollar, a heraldic eagle carrying a banner in its beak reading "E PLURIBUS UNUM" is featured. Below the eagle is either "QUARTER DOLLAR" or "HALF DOLLAR" with a mintmark (if applicable) beneath. Above the eagle, 13 stars are again used to represent the 13 original American colonies with "UNITED STATES OF AMERICA" inscribed. The 1904-S Barber Dime G-4 or Better Liberty Head Dime is comprised of .900 silver (90% silver coins) and .100 (10%) copper, with a diameter of 17.9mm and a mass of 2.50 grams. There were 800,000 of this Barber Dime minted. It is a great value and perfect for any Barber Dime collection. Check out all of our Barber Dimes!